SOS Children's Villages has been working in the Philippines since 1967 and in Manila since 1988. Children in the Philippines continue to face dreadful conditions and our organisation provides families and children in need with support so that they can stay together. SOS Children's Village Manila is situated on the outskirts of the capital city of Manila. Not only is the metropolitan area of Manila one of the largest cities in the Philippines but it is also one of the most densely populated in the world. The economy of this bustling city is diverse, and includes manufacturing as well as services related to the exportation of goods. Manila is a city with enormous contrasts - the gated communities and glittering shopping malls stand in juxtaposition with the makeshift houses where many of the city's poorest live. In order to escape grinding poverty in rural areas, many move to Manila in search of a better life. However, most end up joining the thousands of urban poor and living in slum-like conditions. The improvised shacks can be seen on pavements or on the edges of roads and railways. Others are located near rivers or under bridges, where they run the risk of being washed away by flooding. In the majority of cases there is no clean water, sewerage systems or electricity, and access to other social services such as health care and education is lacking. Families living in these conditions struggle daily to put food on the table and look after their children. The children are often left alone at home when the parents go out to look for casual work or to dig in rubbish dumps in the search of recyclables. Very often children do not go to school and are also forced to work. As they spend time out on the streets, they are exposed to exploitation, violence and the false promises of human traffickers. SOS Children's Villages has been present in Manila for over three decades. In this time we have become well-known and respected among the local population. We also work closely with other organisations responsible for protecting the rights of children. For example, we periodically hold joint workshops on child protection. SOS Children's Villages provides different kinds of support to the local population. Our permanent programmes reach children and young people in need of care. But we also provide emergency relief when the region is struck by natural disaster. For example in 2009, when Manila experienced the worst flooding in 42 years due to a typhoon, SOS Children's Villages helped flood victims in the capital with food, clothes and other essential items. Children who have lost parental care can find a loving home in one of the eight SOS families. The children grow up with their sisters and brothers in a familial environment full of love, respect and security. Each family home has a small vegetable patch, so that the family can grow its own vegetables. 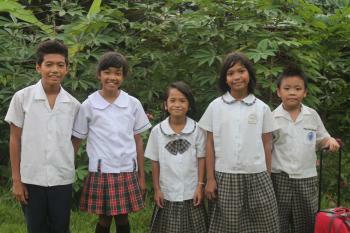 The children from the SOS families attend the local schools and lots of events organised by the local community. The children in our care are offered special support according to their needs, be it with their school work or with therapy. The SOS Vocational Training Centre in Manila has been training SOS mothers and co-workers since 1989.